If I obsess over movies, TV shows and music things wouldn’t be different with food: certain flavors and dishes get my attention from time to time and I find it hard to resist them. 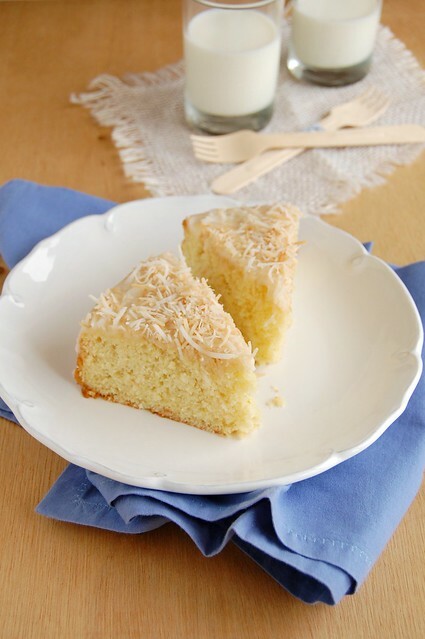 After baking those delicious lime coconut cookies – which looked so cute, by the way – I wanted to make something else with those flavors and this cake was the perfect choice: very tender, with a nice hint of citrus and a delicious coconut topping (I’m a complete sucker for toasted coconut). As a bonus, the recipe comes from a magazine I believe many of us miss, but luckily for us its website is very, very rich. Preheat oven to 180°/350°F with rack in middle. Generously butter a 22x5cm (9x2in) round cake pan and line bottom with a round of parchment paper. Butter paper as well. Toast coconut in a small baking pan in oven, stirring once or twice, until golden, about 6 minutes. Cool. Leave oven on. Beat together butter, granulated sugar, and zest with an electric mixer until fluffy. Beat in eggs, one at a time, followed by the vanilla. Stir together flour and ½ cup (50g) of the coconut (reserve remainder for topping). Stir together coconut milk, milk and 2 tablespoons of the lime juice. At low speed, mix flour and milk mixtures into egg mixture alternately in batches, beginning and ending with flour. Spoon batter into pan and smooth top. Bake until golden and a wooden pick inserted into center comes out clean, 40-45 minutes. Cool to warm, then turn out of pan and discard parchment. Sift the confectioners’ sugar into a small bowl, then whisk in remaining 2 tablespoons lime juice, and rum (if using) and pour over cake. Sprinkle with remaining coconut. I miss Gourmet magazine too! This cake sounds delicious and looks lovely! I love citrus with coconut! Hi, this is a very nice and tasty recipe, thanks for sharing! I made these a few days ago. Amazing. A keeper of a recipe. thanks for posting it! A must make recipe for me... have to make it soon. Esme, that is great news! Thank YOU for letting me know how the recipe turned out! This definitely looks a delicious fresh cake with the mine flavor. Brillant combo to use as an inspiration for a cake!